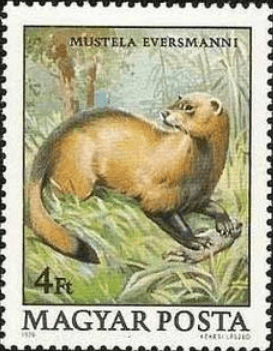 Now that I’ve finally managed to upload Willow the Vampire and the Sacred Grove onto Kindle (despite the wretched formatting still not having worked properly when converting to mobi), I can devote my energies to the world of mustalids again. Before one gentle reader blows another gasket because my last blog post didn’t mention ferrets, here is FERRET in all its versatile mustalid glory! Among the very few good memories I have of my time working and living in London are the occasional unexpected animal encounters. During my lunch hour, hurrying along Marylebone High Street, I would once in a while walk past an unfeasibly large chap with safety pins through his ears and nose, spiky hair and tattoos all over his bulky arms, who’d come towards me with an outstretched arm, his palm turned upwards as if to beg for money. Upon closer inspection, however, his shovel-sized hand contained a sleeping ferret, curled up, snoozing, breathing deeply, its paws and whiskers twitching with whatever adventure it was going through in its dreams. Whenever I’m tempted to make rash judgments upon meeting a person for the first time, I remind myself of this hulk, who outwardly looked like something out of a horror movie, but who clearly had such a gentle heart when it came to animals that he couldn’t bring himself to disturb the slumber of his little friend. Having said that…Hitler adored his two German shepherd dogs…that didn’t stop him from poisoning one of them, just to see how fast a suicide pill would work. When I later moved to Telegraph Hill (about ten mins. walk from New Cross Gate station), I discovered a young woman who regularly walked her ferrets in Telegraph Hill Park. The little creatures followed her placidly on a leash, scampering here and there, sniffing out the world’s secrets. For anyone thinking of adopting a ferret or two as pets, here in the UK there’s the British Ferret Club along with various other organisations, which can help out with information on how best to look after these splendid little animals. Ferrets in captivity can live between 6 and 12 years. They are carnivores like all the other mustelids and, just like cats, they are exceptionally clean animals with great toiletry habits. 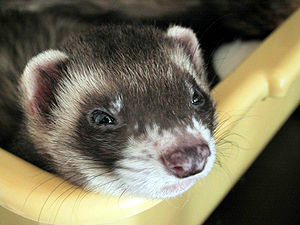 Ferrets are approximately 51 cm / 20 inches long with a long bushy tail, cute small ears and a double layer of fur to die for…literally, since mustalids are typically wiped out for two reasons: their lovely soft fur and their excellent hunting skills, which often brought them into conflict with humans. It is most likely that the ferrets we know today are relatives of the polecat, but it is still undecided if they stem from the European polecat, the Steppe polecat or some animal we don’t even know about, yet. Ferrets have been a domesticated mammal for at least 2,500 years – and the reason they became a working pet was their ability to travel down rabbit’s burrows and drive them out into the arms of human hunters and the ferret’s skilled killing of rodents, in particular rats. In the wild, the Black-Footed ferret is the most endangered species in all of North America. Until the 1920s some 500,000 individuals are believed to have lived across the North American plains, but systematic extermination of the ferrets’ prey, the prairie dog, caused a catastrophic decline, which many believed at the time had led to the ferrets’ extinction. However, in the 1980s a small group of Black-Footed ferrets were discovered. They were entered into a captive breeding program and today there are once again Black-Footed ferrets living in the wild, but they remain threatened by loss of habitat and human intervention with regard to the ferrets’ food source. Ferreting in the metropolis requires careful thought, as these lively creatures need plenty of exercise. In some countries it is even against the law to keep ferrets, because they were either released into the wild or escaped from badly constructed ferret housing and, when they started to breed with local polecat populations, caused damage to the native fauna. It’s not the ferret’s fault, our favourite villain…the human creature of the night…is to blame for such irresponsible actions. I once saw this program where a family had built a ferret house/shed in their garden, which had lots of runways, tunnels, climbing frames and nesting facilities. It was possible to detach a large front panel when the weather got warmer, so that ferrets & co could enjoy the sunshine but not escape. Brilliant stuff. If I ever became a millionair, I won’t want a Ferrari or diamond tiara, just a ferret house like that in my garden! I enjoy these posts very much. I remember seeing a ferret in a man’s arms years ago – it was totally relaxed and comfortable with him – so much so that if he had lived about 300 years ago, he would have been labelled a witch. He had the same effect on birds of prey also. Ferrets are such lively animals, when you see one so blissfully asleep, it’s just so cute. The man you describe might well make an appearance in the Stinking Shadow books! Actually, I have this weird thing with Will Blyton. Characters who I thought I invented about three years ago have turned up in real life – well the description of them has , not their actual personalities. Life imitating art, eh? When a real flesh & blood Vincent turns up at your door step, there’ll be something to ponder about! I’m having a bit of a poo day – my laptop has had a dicky fit so this is coming from Will’s laptop. Anyway, if a real live flesh and blood Vincent turned up on my doorstep – you would have to pick me up off the floor as I live next door to a graveyard! Sorry to hear you’re having one of those days. That’s really funny you living next to a graveyard…only this morning I was thinking about a story line that involved a lady who lives in a converted church next to a graveyard!